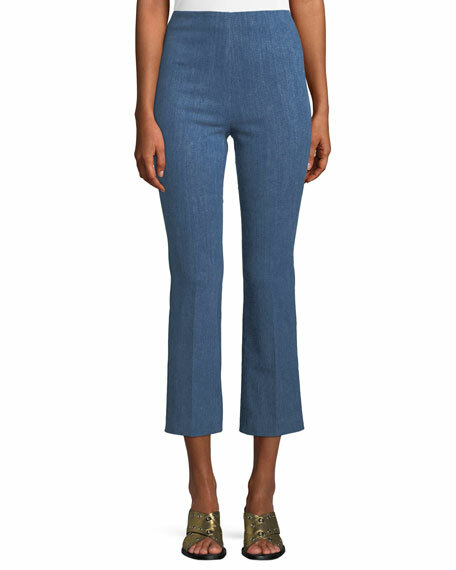 Rag & Bone "Hina" pants in mid-blue stretch-denim. 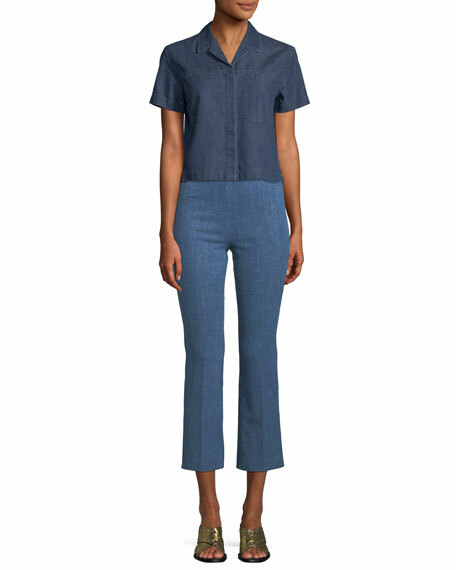 Brunello Cucinelli pants in dark-wash denim. Mid-rise; flat hook/zip fly. Adjustable D-ring belt with monili. Side slip pockets. Back besom pockets. Relaxed legs. Cropped at ankles. Cotton, self & lining. Made in Italy Model's measurements: Height 5'10"/177cm, bust 32"/81cm, waist 24"/61cm, hips 35"88cm, dress size US 2/4. Brunello Cucinelli pants in metallic leather. Mid-rise; flat hook/zip fly. Side slip pockets; back besom pockets. Slim fit; straight legs. Brunello Cucinelli pants in metallic leather. Mid-rise; flat hook/zip fly. Side slip pockets; back besom pockets. Slim fit; straight legs. Cropped at ankles. Lining, acrylic/polyester. Made in Italy. Model's measurements: Height 5'11"/180cm, bust 34"/86cm, waist 24"/61cm, hips 34"/86cm, dress size US 4. 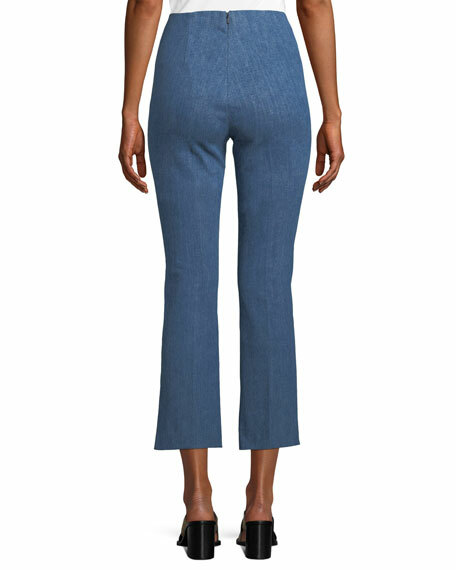 Brunello Cucinelli pants in lightweight wool. High rise; monili-trim self-tie belt. Side slip pockets; back besom pockets. Relaxed legs; pleated front. Cropped at ankles. Hook/zip front; belt loops. Virgin wool/nylon/spandex. Lining, polyester/acrylic/cupro. Made in Italy. Model's measurements: Height 5'10.5"/179cm, bust 32"/82cm, waist 23.5"/60cm, hips 34.5"/88cm, dress size US 2. Brunello Cucinelli pants in plaid virgin wool. Approx. 26" inseam. Mid-rise; tie belt. Button/zip fly. Pleats at front. Side slip pockets. Straight legs. Ankle-length. Lining, polyester/acetate/cupro. Dry clean only. Made in Italy.